It is said there are 365 ways to cook (and eat!) cod in Portugal; one for each day of the year. You might not have as much time as that in your hands but you can certainly make a start and sample a few cod dishes along the way. The locals call it ‘bacalhau’, it’s a national food treasure and comes in all shapes and sizes. Bacalhau a bras, bacalhau a portuguesa, fish cakes… are some of the all-time favourites. Portugal’s most famous food export is the simply delicious pastel de nata, a crunchy flaky pastry loaded with the smoothest and sweetest custard. We would definitely add it to the lists of foods to eat at least … once a day while in Portugal. If cod is the king of Portuguese food, the humble sardine is definitely the queen. Sardines are grilled and loved across the country, particularly in local festivals and celebrations in the Summer months. You will know them by the name of ‘sardinha assada’. If you are in need of a comforting warm stew or soup, you should definitely try ‘caldo verde’ or green soup. This is another must-try classic Portuguese dish made with kale-like greens, potato, onion and sausage. Fish and seafood abound in Portuguese cuisine and menus up and down the country. Freshly caught in the nearby Atlantic Ocean, it will delight fish lovers. The area between Arrifana and Carrapateira on the Rota Vicentina Fishermen’s Trail is known for its ‘perceves’, goose neck barnacles, harvested from the local cliffs by intrepid ‘perceveiros’ (perceve catchers). Perceves are a delicacy that must be tried at least once in life. Grilled, baked, fried, boiled, stewed… you will find seafood, shellfish and fish cooked to all tastes. We hope we whetted your appetite with our selection of Portuguese food. Dear Susan, thank you for getting in touch. Our Customer Care team will email you details, have you got a particular date in mind? Kind regards. Mario is from the countryside of Northern Portugal. He has always loved music and played saxophone in a band from the age of 10. His other passions include football (FCPORTO), travel and gastronomy. Mario studied Business communication and spent time working in the tourism industry. 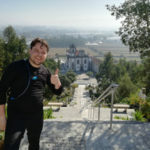 He recently cycled the Portuguese Coastal Camino from Porto to Baiona and loved every minute of it.